MARK D. LUTCHEN is the former Global CIO of PricewaterhouseCoopers. In that role he was responsible for reengineering, reconstructing, and integrating the companys worldwide IT systems during that organizations massive late 90s merger. With nearly three decades of operating experience, he has consulted on IT management with numerous Fortune 500 companies and executives. He currently leads PwCs Business Risk Management Initiative, which provides senior executives with practical strategies to manage IT risks and optimize IT investment and resources. 1. 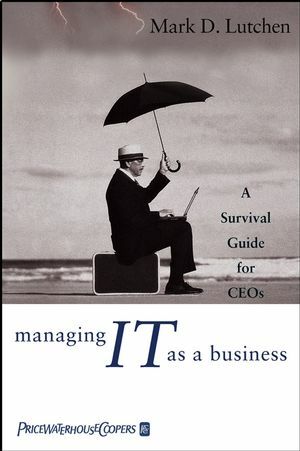 Get the CIO on the Executive Team. 2. Link IT Strategy to Corporate Strategy. 3. IT Management Is about Relationship Management. 4. Align the IT Organization Structure with Profitability Drivers. 5. Understand the Real IT Spend. 6. Focus on Outcomes, Not Process. 7. Leveraging Investment Cycles and the Power of Standardization. 8. Talk about Information Technology and Use IT Appropriately so Others Know It Is Important. 9. Information Technology Improvement Never Ends.